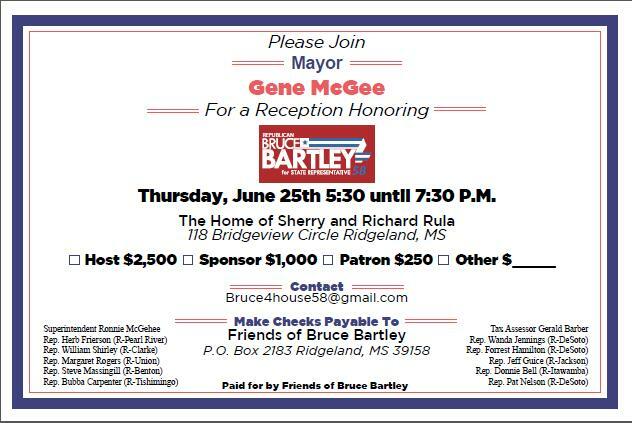 The fundraiser for Bartley is being promoted by Ridgeland's Republican mayor, Gene McGee, and is co-sponsored by a number of current House Republicans including DeSoto County Reps. Forrest Hamilton and Wanda Jennings. In his letter to supporters, Mayor McGee sounds the alarm on the importance of this particular House seat. McGee notes that there are extremist factions within the Republican Party that seek to foster disunity among Republican voters. You may recall Bomgaars's name from a recent post written about his involvement in funding campaigns against Republican House members who have historically supported public education like Reps. Hamilton and Jennings. Bomgaar has already spent a hefty sum supporting House Speaker Philip Gunn's agenda to dismantle Mississippi's public education system. Bomgaar and his allies have already spent tens of thousands of dollars supporting Republicans who have voted against public education such as Reps. Joey Hood of Ackerman and Randy Boyd of Mantachie. 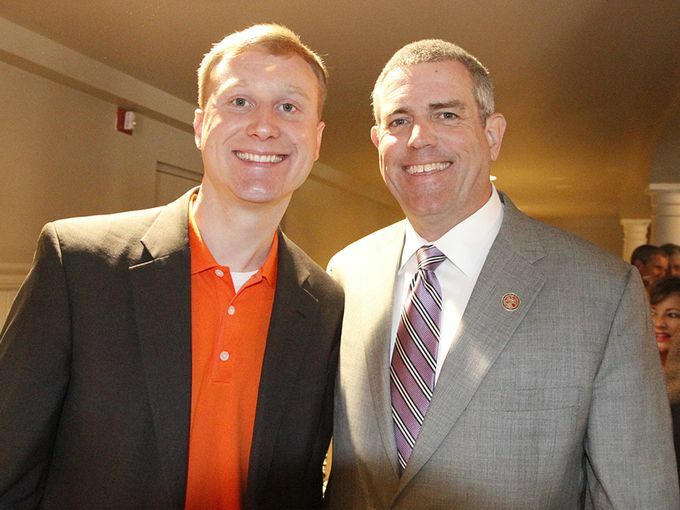 In fact, Speaker Philip Gunn is such a big fan of anti-public education candidate Joel Bomgaar that the Speaker tried to reward Bomgaar's efforts by appointing him to the state Board of Education. The state senate rejected Bomgaar's nomination, likely on the basis that since Bomgaar does not support public education that it would be a disservice to have him serve on this board which provides leadership and oversight of our public education system. This brings us to the contrast that Mayor McGee noted in his letter. 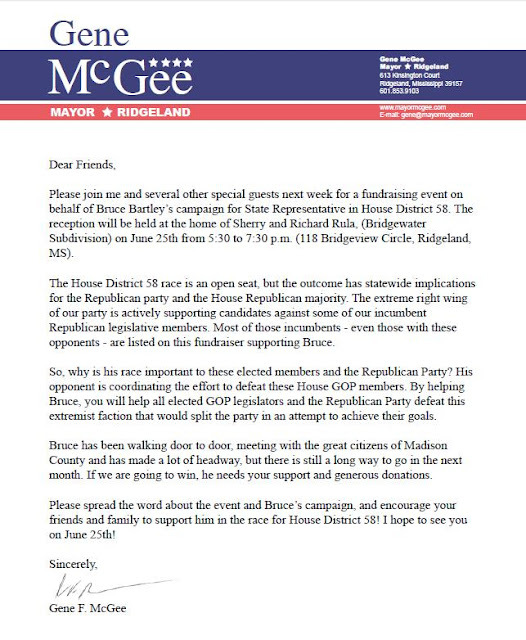 He is correct that there are divisions in the Republican Party, and the fact of the matter is that one candidate for House District 58 appears ready to stand up to the crazy. The other candidate is adding fuel to the extremist fire, and his name is Joel Bomgaar.